Memorandum for Mr. Reese asking him to collect information on the number of African-American employees in the Department of Agriculture. 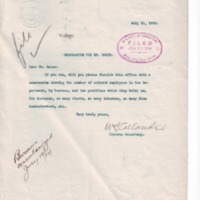 If you can, will you please furnish this office with a memorandum showing the number of colored employees in the Department, by bureaus, and the positions which they hold; as, for instance, so many clerks, so many laborers, so many farm demonstrators, etc. Callander, William F., “WF Callander to Mr. Reese,” 1914 July 13, A071314, Race and Segregation Collection, Woodrow Wilson Presidential Library & Museum, Staunton, Virginia.